It’s been a while since I loaded up a first person shooter: I’m a big fan of real time strategy games and haven’t felt the need to rapid hand and eye coordination. Saw a few screenshots of Medal Of Honor Airborne and thought to give it a spin. The box give the game basics, and in truth you don’t need more. You’re part of the American airborne dropping into six different locations to defeat the Nazi’s. Installation went smooth and I adjusted the configuration to give me maximum graphic details. You start the game with some basic training, but I found it a bit confusing, as you have to attempt three parachute drops and land on your feet without any real instruction. Each mission has a briefing with target details, and you’re allowed to choose your weapons: as you pick up and encounter new weapons they’re made available to you at this stage. Once that gets rolling you’re on to the first mission and first drop into a combat zone. You can control where you’ll land somewhat, and safe areas are billowing coloured smoke. It’s nice to get an aerial view of the battlefield as you go in. On the ground the real game begins. It’s a standard first person shooter with World War Two weapons available. Left click fires from the hip, right clicking you aim down the weapons sights or through the scope. I’m going through the level taking down the enemy when the screen slows and I’m shown a weapon upgrade for my M1: a graphic of your weapon sits on the right side of the screen, slowly filling as you hit more enemies. When the weapon fills you get an upgrade, with three upgrades available for every weapon. They’re usually adding accuracy via a muzzle suppressor or stock, ammo capacity via an enlarged clip, and a scope or bayonet. I was blown away by this concept: rewarding the player as he gets more proficient with his weapon. Awesome! Graphics were top notch for the genre, with a full immersive feel. The settings and tile sets were perfect for each level: I never thought it didn’t fit into the game. Sounds were well done: bullets and explosions but also enemy chatter and interaction with your comrades. Gameplay was what I expected. You’re rarely alone in the game, with support coming from other airborne troops. Enemy and friendly AI performed well: I played through single player on hard difficulty and found the game challenging. You can’t save but must reach save points, which are pretty well spaced out. If you die a lot at the beginning of a mission (like level five) you’ll quickly get tired of parachuting into a hail of gunfire. Once you’ve completed the game you can go back and replay any mission: I redid a few of them so I could get every upgrade on all the game’s weapons. Yes, I enjoyed this new feature that much. Unfortunately I was only able to get through the single player game: I installed Company Of Heroes Opposing Fronts and Medal Of Honor Airborne stopped working. I uninstalled both and reinstalled but still no luck. With that in mind please enjoy the stock screenshots. 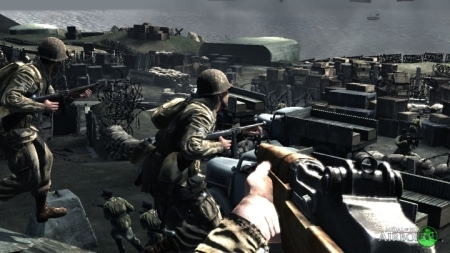 Medal Of Honor Airborne is a solid first person shooter. It adds enough to keep it interesting and a stand out from the rest of the crowd.